Norwegian immigrants on their way to America on the SS Hero in 1870. In the Thursday meeting in which President Trump complained about "having all these people from shithole countries come here" — and singled out Haiti, El Salvador and Africa as examples — he also added that, "we should have more people from Norway." In fact there was a time when we did. From 1870 to 1910 a quarter of Norway's working-age population emigrated, mostly to the United States. You read that right — one-fourth of its workers left the country. Back then Norway was quite poor. Wages were less than a third of what they were in the United States. And the wave of emigration out of the country quickly benefited those who remained. That's because it reduced the supply of workers in Norway, so those left behind could demand higher wages. And this helped narrow Norway's wage gap with the U.S. by 25 percent over that same 40-year period, putting Norway on the path toward its status today as one of world's most prosperous nations. Those are the findings of a paper published in European Review of Economic History back in 1997 by two economists. It's considered a seminal work because the authors — Alan Taylor of the University of California Davis and Jeffrey Williamson — then of Harvard University, now professor emeritus at the University of Wisconsin, Madison — combed through paper archives to piece together the first truly comprehensive picture of wage differentials across European countries and the United States during that time. "They were the pioneers really — the first to do that," says Michael Clemens, an economist at the Center for Global Development, a D.C. thinktank, who specializes on the role of migration in reducing poverty. Leah Boustan, an economist at Princeton University, and several collaborators have done some of the most ground-breaking work of this kind. "We created direct name matches between people who appear in the 1865 Norway census as children," Boustan explains, "and then we looked at the 1900 census in Norway and the 1900 census in the United States. If we found you in the 1900 U.S. census we knew you had migrated." From this information they determined that those who left Norway came from "some of the lowest skilled families. They are coming from either rural areas or they are [the product of fathers holding] lower skilled laborer positions in cities," she says. And on arrival in the United States these Norwegian immigrants remained at the bottom of the socioeconomic ladder. Compared to immigrants from the 15 other European nations that contributed to this great wave of arrivals, "the Norwegians held the lowest paid occupations in the U.S.," says Boustan. "They tended to be farm laborers. They were also fishermen. If they were in cities they were just sort of in the manual labor category — what today you would think of as a day laborer." "So when you look at the people leaving Norway you do pick up quite a bit of evidence of the poor, huddled masses," she says, referring to the famous Emma Lazarus poem at the foot of the Statue of Liberty. And although their descendants would eventually catch up to the rest of the U.S. population, it took a while. 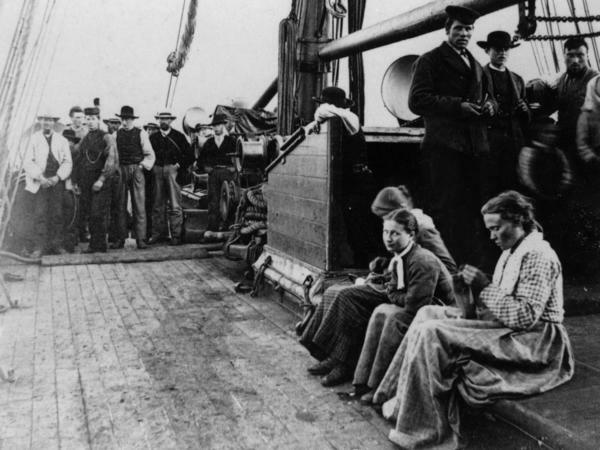 Twenty years after their arrival in the United States, the Norwegian immigrants were still making 14 percent less than native-born workers. In other words, they shared a lot in common with many of today's immigrants from ... El Salvador, Haiti and Africa.